Can today GET any more American? I'm sitting on the expansive front porch of my un-air conditioned farm house, sipping ice tea/lemonade (I drink them together because that's how AMERICAN I am!) and blogging. Just as our founding fathers imagined it would be. Speaking of American heroes, have you seen the VIRAL ag video from the Peterson Farm Brothers, I'm Farming and I Grow it. THIS is America. Kansas farm boys with cut off t-shirts and seed company ball caps, working hard to feed us all. The video was posted Monday by Greg Peterson and now has 3 million 5 MILLON (as of 7/9/12) hits. Take that, P3TA. UPDATE: The OFFICIAL I'm Farming and I Grow it t-shirts, with percentage benefitting the Peterson's. Ryan is getting one of these! And because I get a thrill every time the worlds of agriculture and PR collide, I have to share some of the sweet media hits they have earned. This Huffington Post piece has links to some other great coverage. They were welcomed to the couch on Fox and Friends. The holy grail of media coverage: the Associated Press, baby! Out of Witchita with great background I haven't seen elsewhere. Today, my boys are farming and growing it at a hog show. They may never be whisked off to New York City for network media interviews but I know they will be feeding this nation. 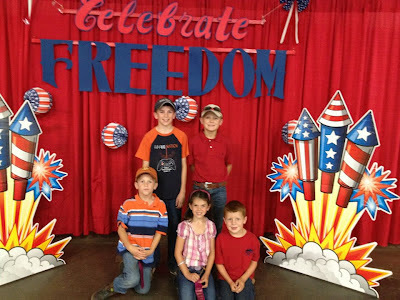 Our all-American farm kids and cousins had a big day showing hogs at the 2012 National Swine Registry Summer Spectacular. Photo thanks to my sister-in-law.